By Prof Marcello Ferrada de Noli PhD, SWEDHR chair. Our article-series in The Indicter, denouncing videos for propaganda aims by the organization “White Helmets”, had a wide spread. The SWEDHR report   was ultimately cited in the session of the United Nations Security Council, as evidence contesting sources on the alleged gas-attacks imputed to the Syrian government (April 12, 29017). We will soon be publishing an updated report on claims regarding the purported chemical attacks. The response of Western media journalists have also in occasions taken a bizarre, seemingly desperate character. This is the case of a report published yesterday (April 14, 2017) by Le Figaro, and authored by its correspondent in Moscow, Mr Pierre Avril [photo at left]. In the article En Russie, une curieuse thèse reprise pour exonérer Damas,  Le Figaro indulges in a series of libellous statements ad-hominem against the messenger of the objective research-conclusions they dislike. Clearly, Le Figaro article carries none whatsoever argument in disputing the conclusions reached by the SWEDHR investigation on the White Helmets. In the absence of arguments based on facts, The Figaro journalist throw instead an slanderous, offensive attack on the author signing the SWEDHR report. I rebut here below the lies posted by The Figaro. I also comment the supportive statement –likewise untruthful– done on behalf of the Le Figaro libel by a journalist of the Swedish TV, Mr Bert Sundström, formerly Swedish TV correspondent in Russia. Sundström is referred by Swedish Television as an currently active SvT correspondent. This article is a first respond to the libellous attack in-persona against the chairman of Swedish Doctors for Human Rights (SWEDHR), perpetrated by Le Figaro correspondent in Moscow. According to Swedish legislation, the statements described below would clearly constitute a criminal offence. In my view, these attacks also show the level of corruption that some Western mainstream journalists have reached with regards to journalism professional-ethics and to ethics generally considered. In rebutting the lies referred to my person, partly regarding claims of an non-existing participation in the Swedish public debate, and partly on my positions on dictator Pinochet, I was obliged to use a profusion of public images of my person, literary portraying different episodes of my public life that are covered by the libel. I hope that this image-reiteration will not result too annoying to the reader. 1969, Professor of Psychology (profesor titular de psicología) at the University of Chile in Arica –to the best of my knowledge, at age 26, the youngest appointed full professor in Chile at that moment. 1971, Professor of Psycho-social methods at the University of Concepción. 1972, Invited Professor at Universidad Autónoma of Nuevo León, Monterrey, México. In Europe: 1997, Professor stipendiat of Social Psychology at Tromsö University, Norway. 2002, Professor of Public-Health Epidemiology at Gävle University College, Sweden. 2005, Professor Head of Research Unit of Trans-cultural Injury Epidemiology at Karolinska Institute, Dept of Social Medicine. 2004, title “Invited Professor” awarded by the Medical University of Havana, Cuba. 2006, Affiliate Professor, Faculty of Medicine, University of Chile. 2007, Professor of International Health, Gävle University College. 2006-2011, Professor member of the Swedish Ethical committee for scientific research, alternative member, Uppsala region (Swedish government appointment). 2007, “Title of Distinction, Professor Emeritus of Public Health Sciences”, Gävle University College, Sweden. The reader may wish to visit these sites, containing my direct witness report as protagonist in different episodes of the resistance against the fascist Pinochet- Click on the images below (or captions) for each chapter. The libellous journalist Pierre Avril writes that I would have tasted espionage endeavours in Sweden [“En plus d’avoir goûté à l’espionnage“], a statement that he put forward immediately after his blunt lie about me being “Pinochet’s companion”. For the sake of the deception, he deliberately omit that I was in fact in charge of the counterespionage unit of my former organization Movement of the Revolutionary Left,  at that time fighting in Europe the macabre Operación Cóndor created by Pinochet and his tyrant-colleagues at the government of countries of Latin America’s southern cone. (6) Le Figaro questions to whom? The journalist states that I have not answered questions to Le Figaro. I say that Le Figaro has never approached me in any form, or posed no questions whatsoever for me to reply. The above is one thing that the otherwise libellous journalist got right. And I am proud of both have taken the defense of Julian Assange and I will continue denouncing the fascist in Ukraine. M. Ferrada de Noli, “Swedish Doctors for Human Rights: White Helmets Video, Macabre Manipulation of Dead Children and Staged Chemical Weapons Attack to Justify a “No-Fly Zone” in Syria“. The Indicter Magazine, March 6, 2017. M. Ferrada de Noli, “White Helmets Movie: Updated Evidence From Swedish Doctors Confirm Fake ‘Lifesaving’ and Malpractices on Children“. The Indicter Magazine, March 17, 2017. The Indicter Channel, “Report by Swedish Doctors for Human Rights referred in UN Security Council. White Helmets, Syria“. YouTube, Published on April 13, 2017. Friends of Syria, “The REAL Syria Civil Defence, Saving Real Syrians, NOT Oscar Winning White Helmets, Saving Al Qaeda“, Posted April 5, 2017. AP, “Germany ups financial support for Syria’s White Helmets“. AP, September 23, 2016. M. Ferrada de Noli, “Why Is Sweden Giving the “Alternative Nobel Prize” to Syria’s ‘White Helmets’? The Indicter Magazine, 25 November 2016. The Indicter Channel, “White Helmets video with fake life-saving procedures deceived UN sec council“. YouTube, Published on March 12, 2017. M. Ferrada de Noli, “Swedish Doctors for Human Rights Reply to German ARD/BR-Television ‘Verification Team’ ref. RT interview on White Helmets video“. The Indicter Magazine, March 14, 2017. AFP, “Russia “expels” Swedish TV journalist“. The Local, September 7, 2005. Swedish TV, “Här är SVT:s korrespondenter“. Retrieved April 15, 2017. CV with Links to documents: “Professor Marcello Ferrada de Noli PhD – Academic CV“. Retrieved April 15, 2017. CV (only positions-list) Professor Ferrada-Noli, “Portfolio-documents, diplomas, media clips and photos of my academic life“. Acadoc.wordpress, December 29, 2009. DN, “Professorn har seglat i farliga farvatten” [“The professors has sailed in dangerous waters”), Dagens Nyheter DN, Exclusive personal interview, July 17, 2007. 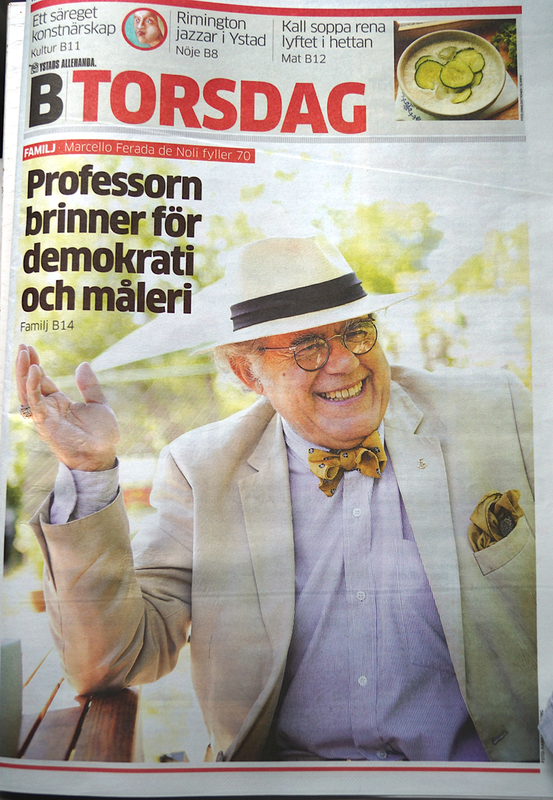 Ystads Allehanda, “Professor brinner för demokrati och måleri” [“The professor cares for painting and democracy”]. Ystad Allehanda, Exclusive personal interview, July 17, 2007. “Professor i Gävle; Precis vad jag förespråkat”. 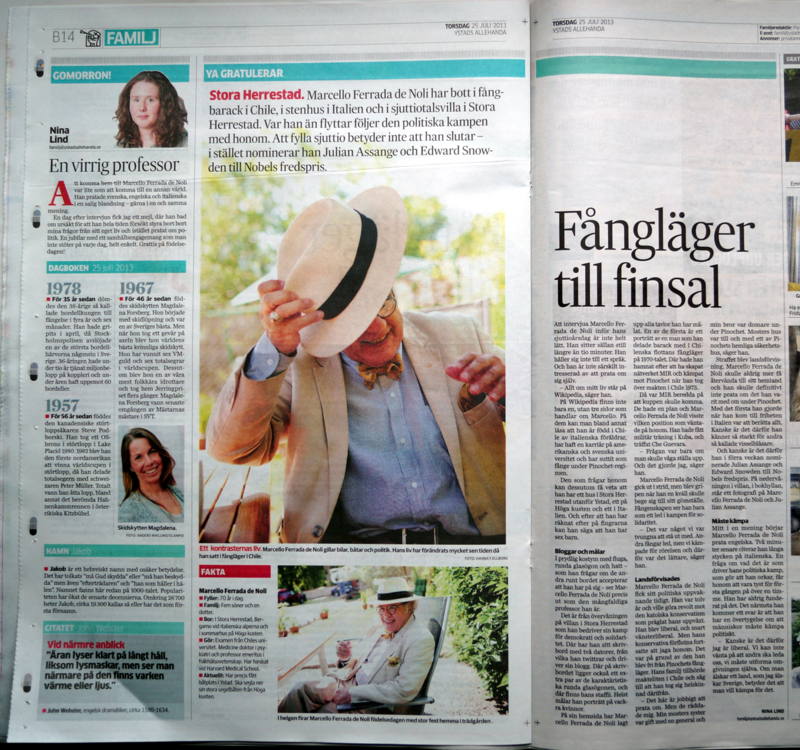 Arbetarbladet, Exclusive interview, August 8, 2007, pages 6-7.
a. Dagens Nyheter (DN). [Several articles]. Retrieved April 15, 2017.
b. Svenska dagbladet (SvD), “Professor dömer ut sjukskrivningar“. 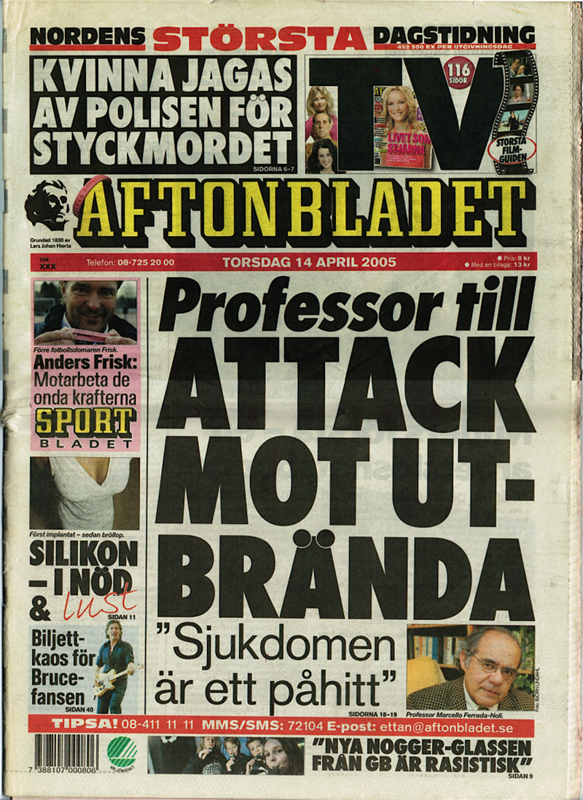 September, 19, 2002.
c. Aftonbladet, Front page: “Professor till attack mot utbrända“. Interview text: “Utbrändhet är ett påhitt“. Aftonbladet, April 14, 2005. Dagens Nyheter (DN). [Articles by/on Swedish Doctors for Human Rights]. Retrieved April 15, 2017. ”En skarp protest mot detta oförlåtliga dödande”. Swedish Doctors for Human Rights, Dagens Medicin, October 6, 2015. Läkartidningen [Several articles]. Retrieved April 15, 2017. Wikipedia article: Marcello Ferrada de Noli. Retrieved April 15, 2017. Associated Press, November 1, 1998. “Chilean in Norway files against Pinochet”. Oslo, November 1, 1998 (AP). NTB/Dagblad, “Pinochet politianmeldt i Norge“, Oslo, November 1, 1998. Defamation in Sweden. Retrieved April 15, 2017. Ferrada de Noli VS. Pinochet, PART I. That morning of September 11, 1973. A personal testimony . Retrieved April 15, 2017. Ferrada de Noli VS. Pinochet, PART II. The Resistance aftermath. Prisoner at the Stadium . Retrieved April 15, 2017. Ferrada de Noli VS. Pinochet, PART III. My life as Pinochet’s prisoner in Quiriquina Island. Retrieved April 15, 2017. Ferrada de Noli VS. Pinochet, Part IV. Professor files VS. Pinochet, “Bring Pinochet to European Court of Justice”. Retrieved April 15, 2017. [For the texts, klick on the links below the image]. Wikipedia article, Movement of the Revolutionary Left. Retrieved April 15, 2017. Wikipedia article, Operación Cóndor. Retrieved April 15, 2017. In 2010 Professors blogg took as one central theme the defence of the Human Rights of the WikiLeaks founder Julian Assange, in several items infringed by the Swedish authorities and journalists in the Main stream media. This also lead to a witness-testimony by the author on behalf of Julian Assange’s legal defence in London 2011. In July 2012, over 150 analyses and other articles had been published here on behalf of this human-right cause. Now, April 2017, together with the publications in The Indicter, the articles would be well over 200. The denouncing of the Odessa massacre deserved a special section in the SWEDHR.org site.